Southland's Erin Criglington has done it again. 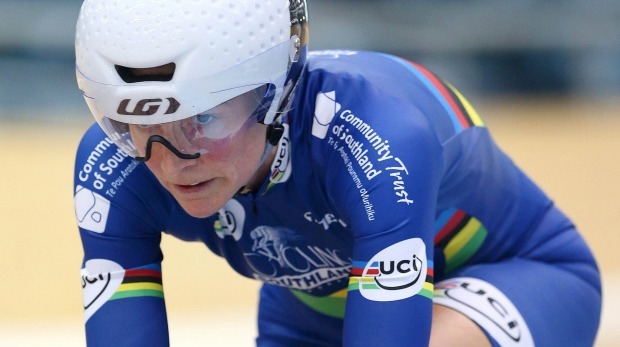 Criglington has added yet another gold medal to her overflowing collection when she took out the individual pursuit at the World Masters Track Cycling Championships in Manchester, England. In qualifying the Invercargill accountant was up against Mel Symon from Australia. She posted a season's best time of 2min 34.629sec to qualify the fastest for the gold medal ride in the 40 to 44 year-old category. Criglington then went up against Ireland's Susie Mitchell in the gold medal ride. Mitchell started fastest, but the Southlander managed to pull her back after the first 500m and then managed to hold on to beat the fast finishing Mitchell. Not surprisingly Criglington's favourite event on the track is the individual pursuit It is Criglington's third trip to a world masters championships and she has picked up a gold medal in each of them. "Absolutely relieved and rapt to do the three-peat. Bring on the rest of the weeks racing," she said after the gold medal win. Criglington was awarded the masters achievement of the year honour at this year's Southland Sports Awards and is in the box seat to repeat that next year given what she has produced in Manchester. Meanwhile, overnight she had her first attempt at a team pursuit, teaming up with Susie Mitchell and Orla Hendron from Ireland, the "emerald blacks" road a tidy pursuit to qualify second fastest behind the GB trio, and overnight rode for gold. They unfortunately rode 3 seconds fast than their qualifier but still had to settle for second and silver against the extremely experienced Great Britain team. Finally, Neil Familton and Grant Tyrell had the individual pursuit qualifying. Familton had a creditable ride to finish a disappointing 5th - outside his personal best and also just off a medal ride. Tyrell on the other hand has qualified 2nd and will be riding for gold tonight.